GuildQuality is proud to have partnered with SAWDAC for the association’s second annual Service Excellence Award, which recognizes contractors who are leaders in customer service. This year, 15 contractors applied, and two received the 2017 SAWDAC Service Excellence Award: Lincoln Building Products and 1st Choice Home Solutions! Eligible applicants had to first submit a representative sample of customers for GuildQuality to survey (at least 50). Next, GuildQuality contacted the contractors’ customers via email, phone, and mail to survey them about their experience with the SAWDAC contractor. To best understand these customers’ true satisfaction levels, GuildQuality asked questions regarding communication, quality of materials, job site cleanliness, and the ultimate indicator of satisfaction, likely to recommend. Overall, this group of contractors achieved an 88% recommendation rate; that’s 18% higher than the national average! And, this year’s award winners achieved a 97% and a 100% recommendation rate, clearly demonstrating their commitment to quality. Having surveyed over 1.4 million homeowners, it’s no surprise 2,000+ successful home builders, remodelers, and contractors already trust GuildQuality’s customer satisfaction surveying to get authentic customer feedback. 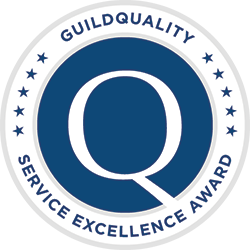 And, GuildQuality works with dozens of organizations around the country to power service excellence award programs, such as this one. If you’re interested in partnering with us for an award for your organization, please contact marketing@guildquality.com.